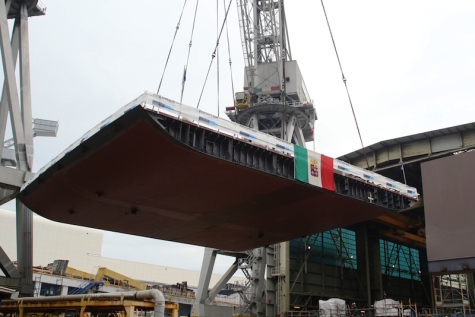 TRIESTE, Italy --- The keel laying ceremony of the multipurpose amphibious unit (LHD or Landing Helicopter Dock) took place today at Fincantieri’s shipyard in Castellammare di Stabia, marking the beginning of the slipway works of the unit. The [ship] will be approx. 215 meters long with a maximum speed of 25 knots. It will be equipped with a combined propulsion system diesel/electric and gas turbines (CODLOG). The LHD's main mission is the transport of people, vehicles and loads of different kinds and in their transfer on land in port areas through on-board systems and in not equipped areas with on board staffing vessels (such as the LCM landing craft units with a load capacity up to 60 tons, four of which can be admitted, launched, and recovered through a flooded basin, located on the stern of the vessel).